When renting any vehicle, often the issue of insurance is a worrying factor for many, as the general preconception exists that motorhome insurance is going to come with a huge excess in the event of damage. The fact is that it's simply not the case! These days as motorhome hire has become more and more popular, rental companies have realized that people need insurance that actually ensures they won't be left penniless in the event of an accident. When hiring a motorhome, the rental company will ensure that the motorhome insurance is both fully comprehensive and covers absolutely everything. These days many companies charge a security deposit, but this is unrelated to the insurance. When renting a motorhome, it's important to check with the rental company how much the motorhome insurance excess is and more importantly if you can reduce it. 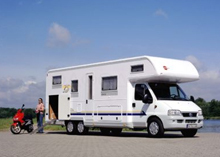 Typically, motorhome insurance is available for anyone over 25 and under 70. The only requirements are generally that you have a full license with at least a year of driving experience. If you fall within the specified age group, you'll find that there are no significant insurance premiums to pay and everything shouldn't be a problem. However, if you're under 25 or over 70, it may very well be possible to still drive a motorhome but you may be forced to pay an extra insurance premium. Hire companies have been known to charge over the odds. When looking for motorhome hire, sometimes the cheapest deal is the one that has the largest excess. Because of this it's important to check around, to see just how much you should be paying and also what exactly it covers. You'll probably find that motorhome insurance won't cover accidents involving low bridges and the likes. While it's perhaps hiring a motorhome has been a worry for many, the fact is that it's a great way to explore the countryside and have a tremendously relaxing holiday to boot. There are motorhome hire companies out there offering insurance packages which are affordable and most importantly, won't leave you with nothing if there's a problem. Motorhome hire can be enjoyed be almost everyone and with comprehensive insurance you don't need to worry about a thing. Motorhome insurance may be comprehensive, but it's important to take care and ensure that when travelling, you park up in a camping site and also you take care of your belongings because motorhome insurance only actually covers the vehicle. As with any vehicle, be careful and ensure your valuables are well out of site. Ultimately, a motorhome holiday provides opportunities that lets you can explore not just the UK but also the whole of Europe. It's generally really easy to get motorhome insurance to visit Europe and all you need to do is to let the hire company know in advance and pay is a slightly higher insurance premium. You can then explore the whole of the continent at leisure enjoying what must be one of the most relaxing self-catering holidays ever.